The only pitfall of this GPS message for my son’s birthday? Now everyone is going to expect one! When my eldest turned 18 in January, I had a choice to make. I could pop to the mall and buy a card for $3.99. Or I could spend a couple hours designing a custom, city-sized GPS message and then roll out of bed before five in the morning to squeeze in 30-kilometre’s worth of bike-writing before breakfast. My motto: anything to avoid a trip to the mall! And how, you may wonder, did the birthday boy respond? “Post it on my Facebook wall,” said the teenager who generally doesn’t want his dad anywhere near his Facebook wall. I dedicate this small victory to parents of teenagers everywhere! 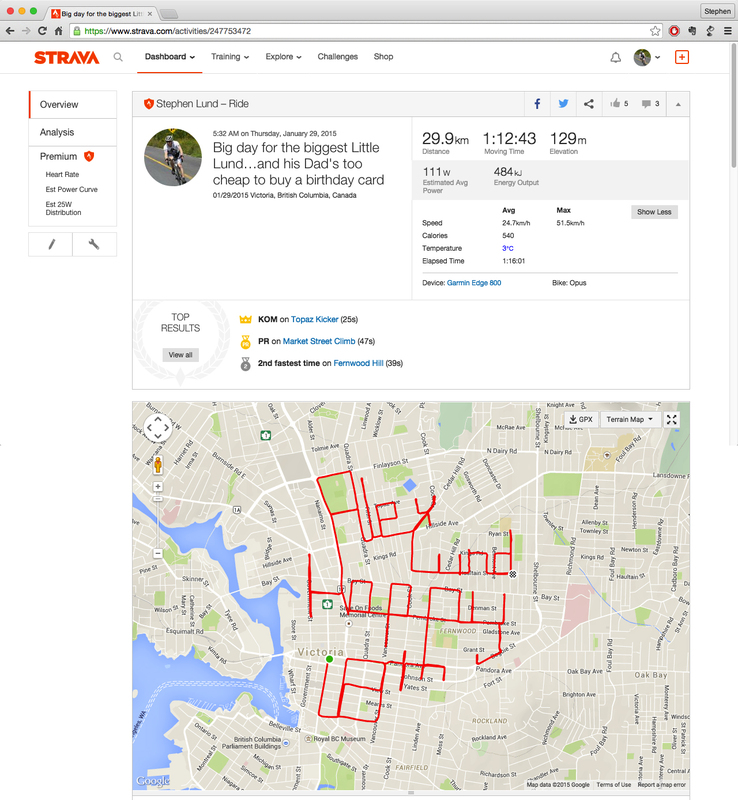 This entry was posted in bike-writing, gps art and tagged bicycle, bicycling, bike-writing, birthdays, creativity, cyclist, garmin, gps, gps art, strava, strava art, victoria bc. Bookmark the permalink. Brilliant! And even better: it was appreciated! !